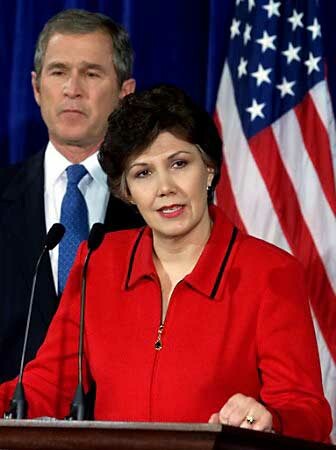 President-elect George W. Bush on Tuesday completed building his diverse cabinet by picking conservative columnist Linda Chavez, an Asian-American Democrat and the grandson of Lebanese immigrants. But already, the selection of Chavez has raised concerns among Latino groups. "Bush needs to seriously reconsider how he is making his administration 'diverse,'" said Marisa J. Demeo of the Mexican American Legal Defense and Educational Fund (MALDEF). "A Spanish-sounding surname does not make a person sympathetic to the concerns and needs of the majority of the Latino population. Who exactly is Bush trying to reach in the Latino community with this nomination?" The selections came as Bush geared up for a potentially contentious confirmation battle over his selection of Sen. John Ashcroft as attorney general. Tuesday's nominees were Chavez, a U.S. Commission on Civil Rights official during the Reagan administration, as labor secretary; former Democratic Rep. Norman Mineta, now President Clinton's commerce secretary, as transportation secretary; and Michigan Sen. Spencer Abraham, defeated for re-election in November by Democrat Deborah Stabenow, as energy secretary. Of the 18 top appointees named so far Bush, including cabinet members and White House staffers, only seven are white males. The group includes six females, three Hispanics, three African Americans and one Asian American. The selection of Chavez fits into Bush's effort to mold a new image for a Republican Party long identified as the party of the wealthy. Chavez thanked her late father, a house painter, for teaching her "the dignity of manual labor.'' She also thanked her mother, who worked in restaurants and department stores. "If I am confirmed as secretary of labor I intend to keep faith with the men and the women who still work at jobs like those my parents held,'' she said, promising vigorous enforcement of agency regulations mandating non-discrimination by federal contractors. Chavez has been an outspoken opponent of affirmative action programs and served as a Bush adviser on immigration matters during the campaign. Chavez's personal political journey is unusual. As a senior at the University of Colorado, she joined Mexican American and black students in demanding affirmative-action programs. But a decade later in the Reagan administration she opposed "racial preferences." The Mineta selection allowed Bush to meet his most challenging diversity goal -- getting a Democrat on his team. Mineta got the job because he is qualified, said Bush. "But it's also important to send a signal that this is an administration that recognizes talent when we see it, regardless of political party,'' he said. Mineta, named commerce secretary by Clinton last year, said he has not changed teams despite joining Bush's. "Over the last year this country has witnessed a very hard-fought election and I was proud to stand with my party,'' Mineta said. "However, the campaign is over and under our constitutional system a decision has been rendered and we are not in the essential transition period when we move from campaigning to governance,'' he added. During the campaigning phase, Mineta questioned Bush's forthrightness following revelations of a 1976 drunk driving conviction. Mineta, a Japanese-American who was held in an internment camp in California during World War II, developed transportation expertise while he served as chairman of the House Public Works and Transportation Committee. He represented a San Jose, Calif., congressional district for 21 years before resigning in 1995 to become a senior vice president with Lockheed Martin. Bush said the pending battle over Ashcroft does not threaten the bipartisanship he is attempting to build with efforts such as picking Mineta. Bush's brand of bipartisanism took a hit Tuesday in a watchdog group's report showing that the 474 people appointed by Bush to policy advisory teams contributed a total of $5.6 million to political campaigns in the last election cycle, with 95 percent of it going to Republican causes and candidates. In picking Abraham, the grandson of Lebanese immigrants, for the energy post Bush gets an ally in his push for energy exploration in portions of the Arctic National Wildlife Refuge, a concept branded by opponents as environmentally foolish.